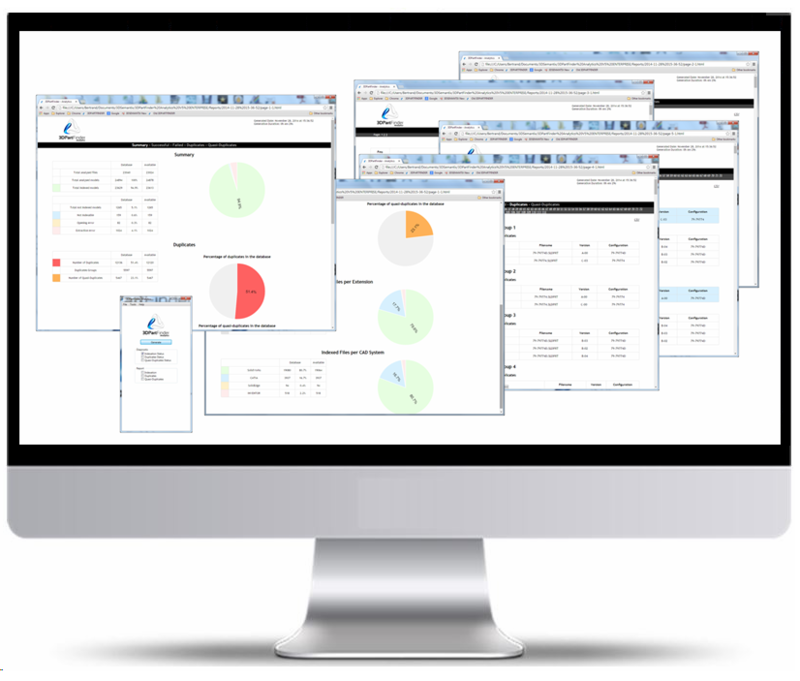 Prior to implement or migrate to a new PDM/PLM, let 3DPartFinder Analytics locate all duplicates. Clean them up and start reuse efficiently! 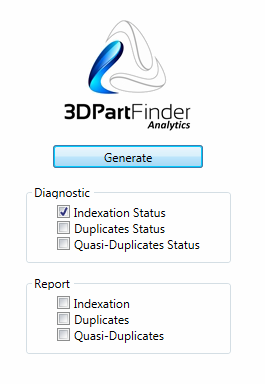 Let 3DPartFinder Analytics identify the percentage of duplicates, nearby-duplicates and similar parts. You now have a solid base to estimate your reuse rate! Let 3DPartFinder Analytics identify the most similar parts for each, pick the ones with high volume or high cost and create standard parts to reduce cost and accelerate Product Development! 1.No need to have a PLM! 2.You have a PLM that’s OK! 4.3DPartFinder Analytics offered as a service or licensed. 1.Get actual Duplicates & Nearby. 3.Once completed, implement 3DPartFinder to maximize reuse and put an end to part proliferation! 3DPartFinder provides you with the exact amount of duplicate and nearby-duplicate parts in a specific database or all databases. With a simple business process in place, the implentation of 3DPartFinder can put an end to the creation of duplicate and nearby duplicate parts. Nearby duplicate parts are parts that have been created but are extremely similar to others. If you knew existing parts were available you would not have created them. Now set a threshold value to 3DPartFinder Analytics and get the most similar parts for each of them. Take a representative sample of parts and get the most promising candidate for reuse according to their probability for substitution or integration in a new product design. Simply add the number of duplicates, nearby-duplicates and most similar ones and you obtain a fairly accurate estimate of your potential reuse rate! 3DPartFinder Analytics will automatically identify the most similar parts for each of them. Set your priorities. To make it easier for you, adjust the similarity threshold value and get only the very similar at first. Or review those with highest production volume, higher value or higher cost depending on your strategy. Now that you made your choice replace parts and keep track of your savings! Take control of your 3D models with 3DPartFinder Analytics. Get rid of duplicates and nearby duplicates, estimate your reuse rate and measure your reuse progress! 3DPartFinder index the highest quality data which is the native CAD data. Our advanced algorithms allow then to differentiate duplicates and nearby-duplicates to ease your analysis. There are very few parameters to set up before launching 3DPartFinder Analytics and they are very intuitive to determine. The efficiency of 3DPartFinder Analytics allow you to run it every day and therefore measure your reuse progress. 3DPartFinder identify all duplicates and similar parts and give you access to all information!